Molyneux Calls the PS Vita "Gimmicky"
Free from constraints, Molyneux can finally speak his mind. 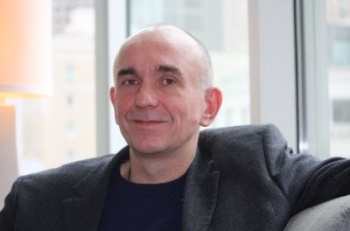 Peter Molyneux departed the Microsoft-owned studio he founded this year. Lionhead is still making Fable games, but Molyneux is a free agent, so to speak, at new indie studio 22 Cans. While he's never been reticent with commentary, Molyneux has drawn the line at criticizing Microsoft's competitors ... until he realized he didn't have to anymore. Speaking with commentators on Spike TV after the Sony press conference last night at E3, the Brit said he wasn't excited to design games for the PS Vita handheld. "I have to say, purely speaking as a designer, it just doesn't excite me," said Molyneux. "The back touchscreen, I thought it was quite cute, there's quite a few games that have the tap on the back." He continued with some real critical language. "But, you know, I'm not there. I'm sorry. It's gimmicky; it's another thing to put in my pocket." Molyneux did have a positive reaction to at least part of Sony's presentation, the reveal of the next game Beyond from French studio Quantic Dream. "Anything that David Cage does I think is super interesting," he said. "You can say what you like about his previous titles but they really are cutting edge and innovational." Way to make up a word there, Peter.